1. 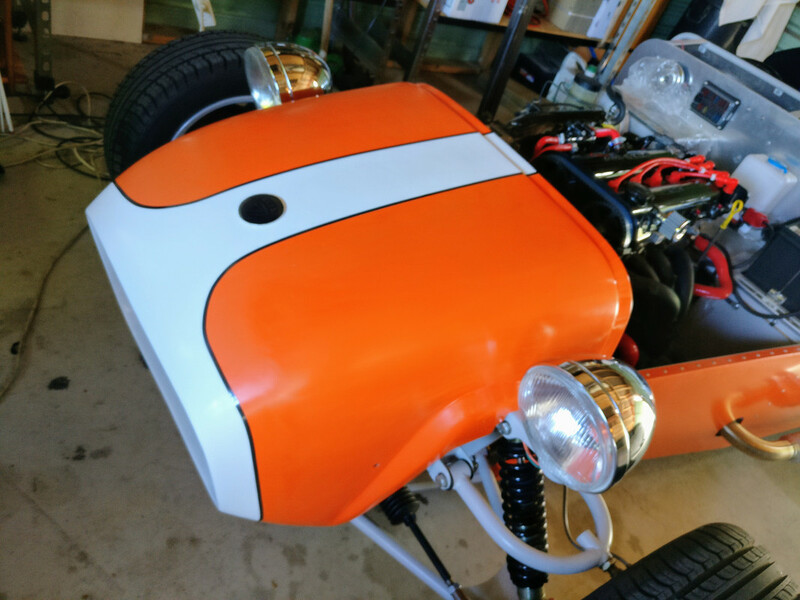 ONE thread per project please. You all have access to edit your own posts, so do that. You may post as many times as you feel like it within your allocated thread. 2. Only the person who owns the thread may post in it. Any others will be deleted. If you want to ask questions, comment or start a discussion, start a thread in the Project Discussion section or use the private message function. 3. You may not use your thread for anything else apart from showing off your car and it's build process, use the other forums for this. 4. Thread titles must be include your user name and a little about the project please. Finished tig welding all the exhaust componts at work and trial fitted on car. 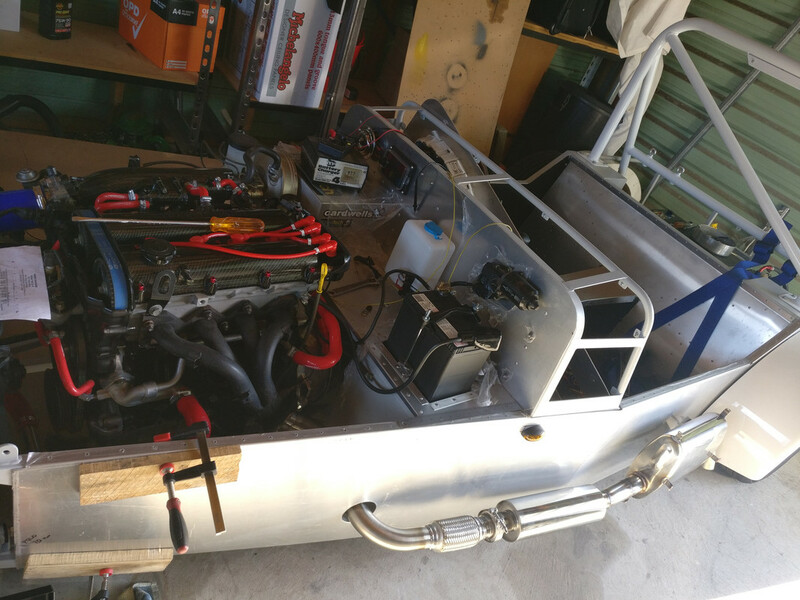 With this done I was able to throw some fuel in the tank and try starting the engine for the first time. Cranks with good spark but won' t run. Fuel pump is working but the cylinders are dry. Seams to be a problem with the injectors not firing . Drop a bit of fuel down the plugs and it fires into life. Having a bit of trouble working out the wiring on the circut opening relay. I have the wiring diagram for the miata engine but not being a auto electrician, found it a bit hard to get my head around. Otherwise making good progress. Found the problem with the circuit opening relay. ( operates fuel pump) Needs to be a relay with two coils. One opened by the ignition switch and the other by the air flow meter. Picked up one off Trademe for $30. They are normally $150 new. Expensive relay! 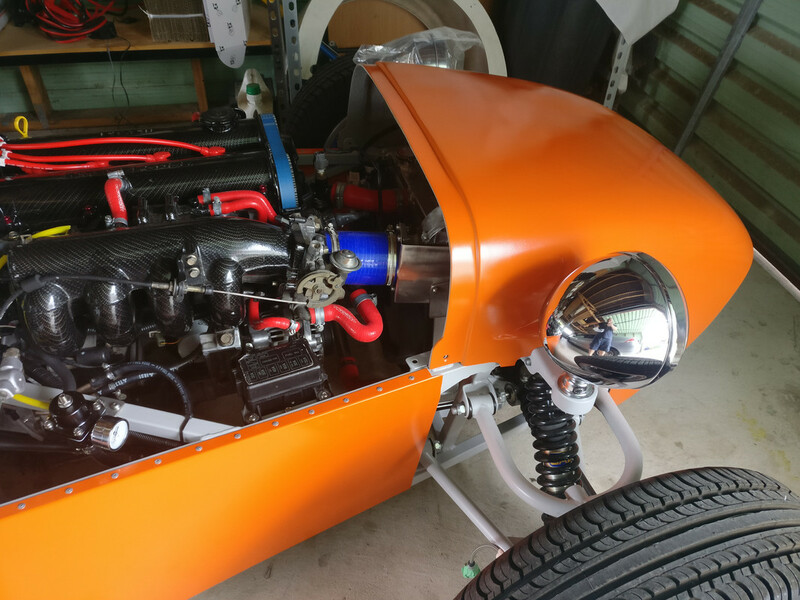 So finally got fuel flow into the cylinders. Also fitted an after market regulator with guage so I can check on fuel pressure as am using an out of tank fuel pump. I then noticed some fuel leaking around the injectors. Removed them and found the rubber seals were rock hard and were loose. Brought some on trademe, $2.50 each , cured the problem! At the same time gave the injectors a clean with carb cleaner, as per a video on You Tube. After all that the engine would fire but not keep running. Oh crap! Nothing to do but go over the wiring again, check the coil and hope it was'nt a computer problem. I then found a loose earth wire on the cam sensor. Those crimped on fittings rearly arn't that great and I plan to go over all mine and solder the wires on. 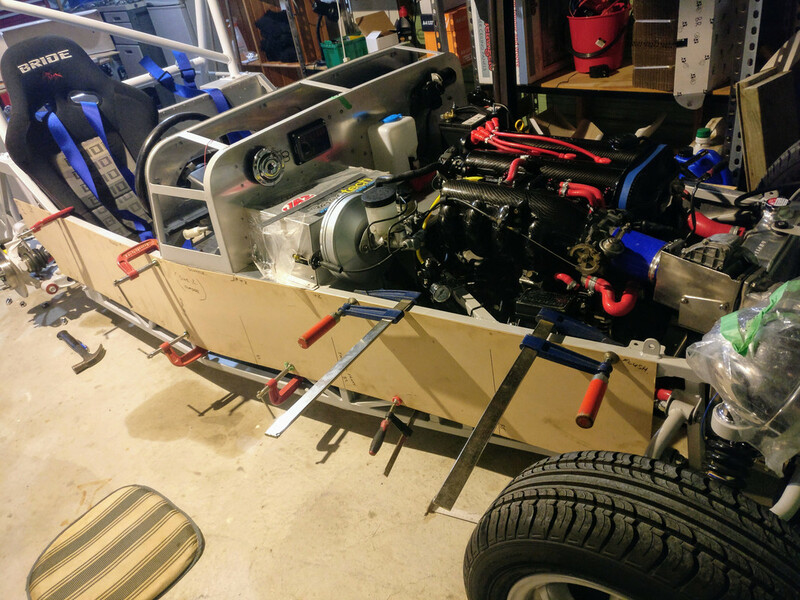 Now I have a engine that starts and runs, woohoo! 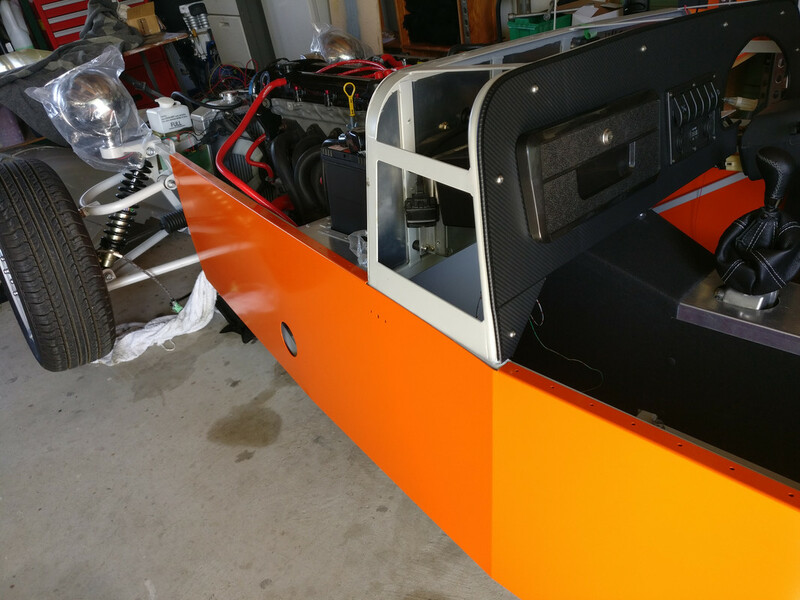 Yesterday wrapped a board around the right side of the chassis and marked the dimensions for the outer panel. Hope to fold it this weekend. Also changed my mind about the vinyl I had covered the consol with. Removed it and recovered with the carbon fiber vinyl many use. A big improvement. 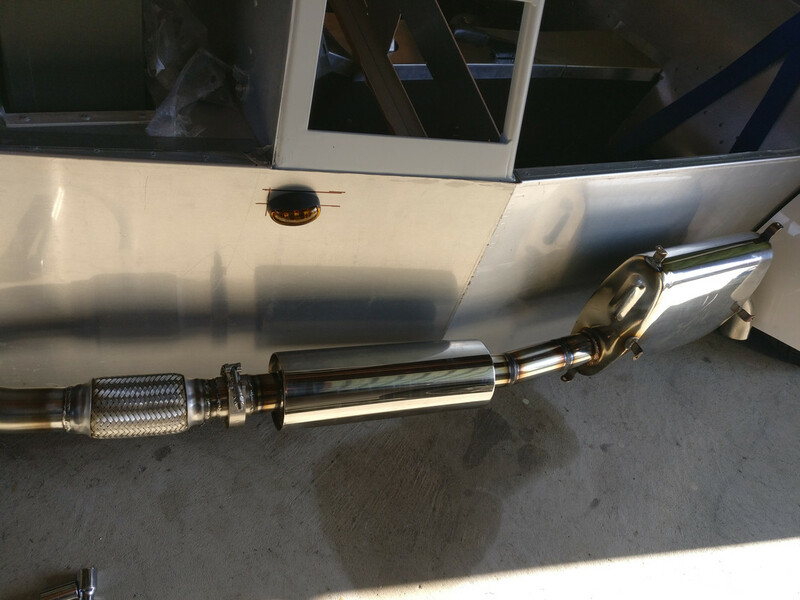 Picked up some carbon looking mirrors from Trade-me to be mounted later. 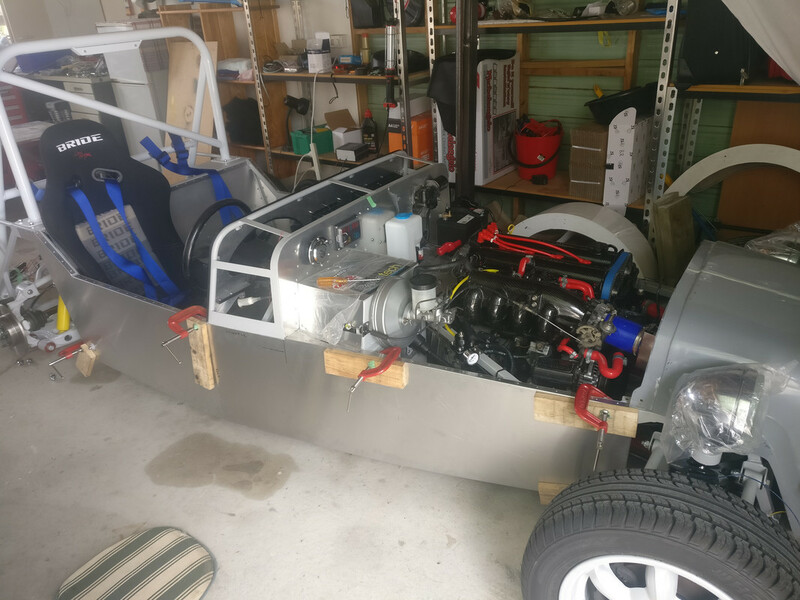 Needed to turn the car around in the garage to get more room and with the engine now running drove out, backed up and back in again. Careful that I only had a handbrake as the front brakes arnt hooked up yet. 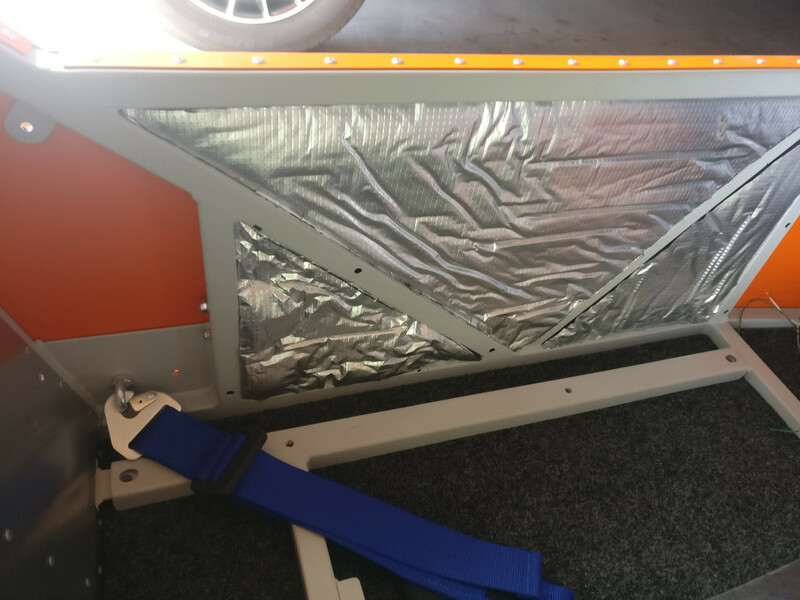 Went into work this morning, cut, drilled and folded the second side., Took it home and tried on the chassis. Fits well so im pre drilling all the rivit holes in the chassis for both sides and will get them powder coated next week. Picked up my side panels today from the powder coaters. Almost a dayglow orange. Guards and scuttle will be white, which I'll probally spray myself , to break up the shockingly bright color. 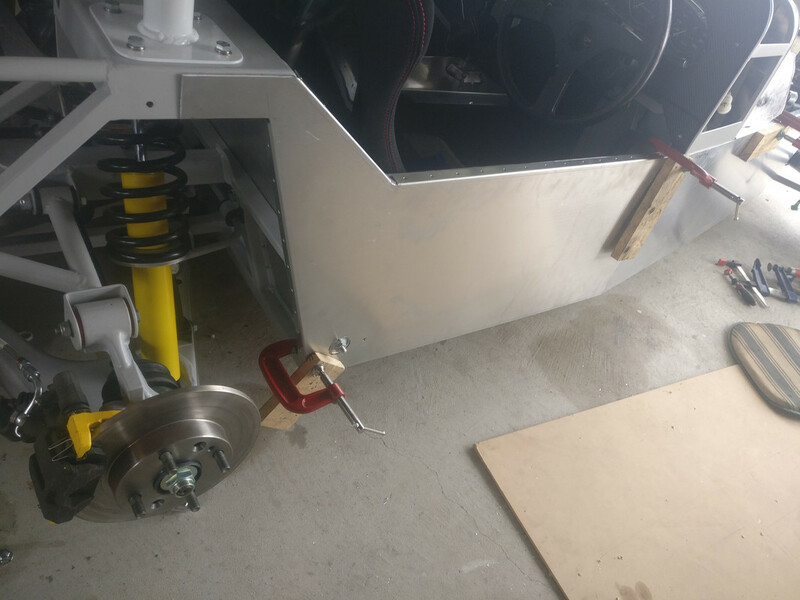 Having two weeks break over the Xmas holidays and the wife overseas, has given me lot's of spare time to work on the car. 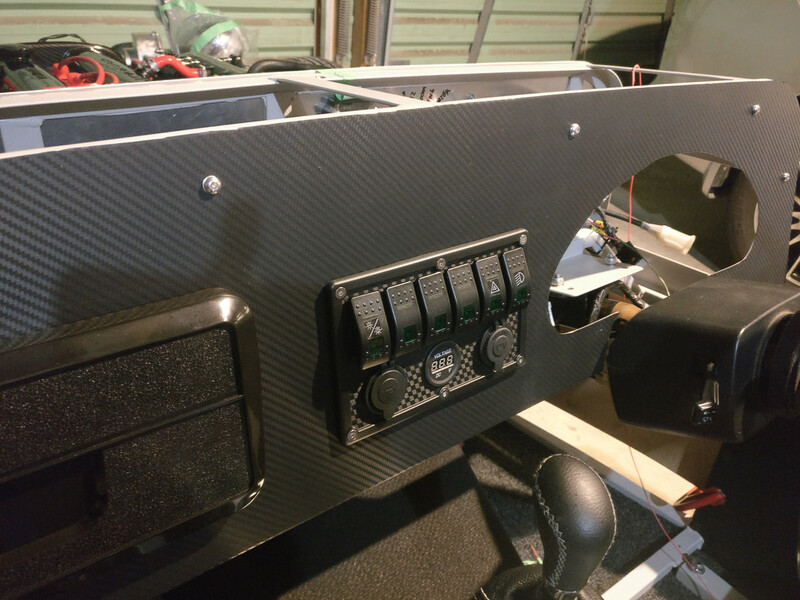 So far I've finished fitting the interior panels and carpeted them. 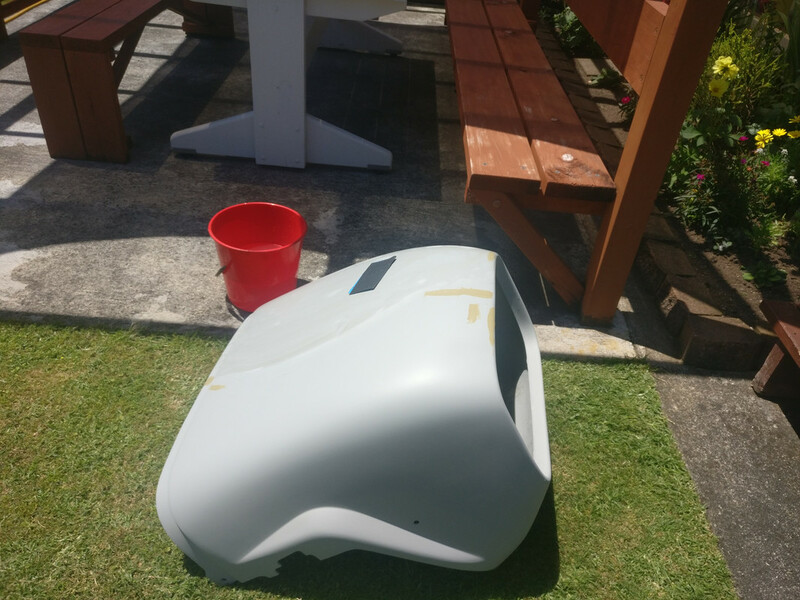 Today have cleaned up the nose cone. A second hand Almac one cut down the centre and 60mm removed to fit my chassis. Fibreglassed and bogged up . Two coats of 2D primer sprayed on today. Rubbing down between coats while sitting under my pagola in the sun. 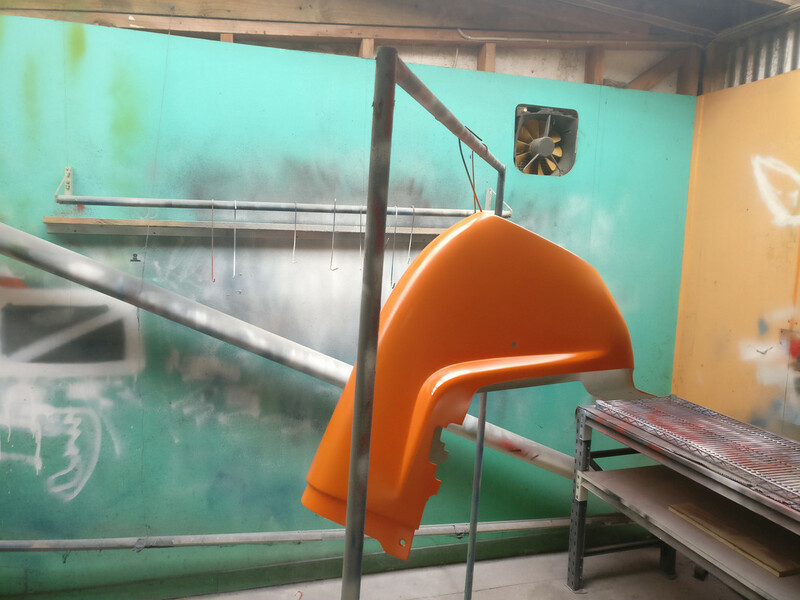 Tomorrow I'll apply a couple of coats of bright orange, matched to the powder coated sides . 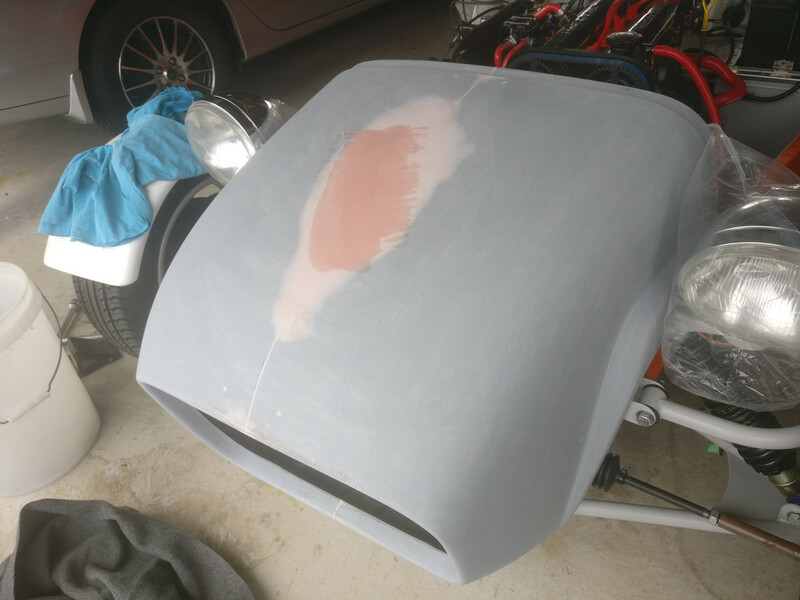 Gave the nose it's first coat of orange. Will rub down with 240 grit paper and respray in the afternoon. Later to be followed by a white stripe down the middle and around the mouth. Very pleased with the colour match to the sides. This week have been fitting the front hard brake lines. Today bled them and all working well with no leaks. Couldn't resist a little squirt down the road to try them out. Nice smooth effortless braking as have kept the booster so many don't use. Also pinstripped the nose cone. Just needing a coat of clear and a polish. 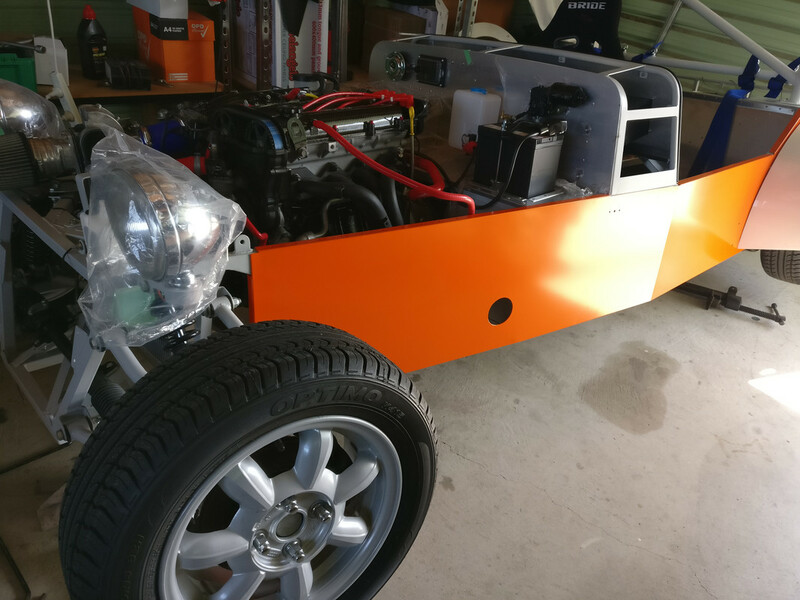 I got a Caterham super 7 badge for top of nose and a stainless steel 7 grill badge from the UK . 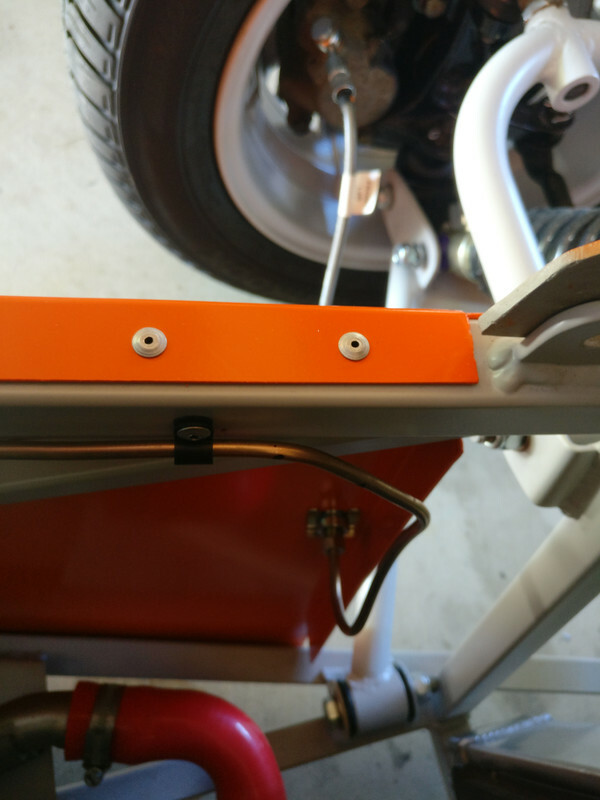 Will make a wire S/S grill to mount it. Working for a shelving company gives me access to a wire spotwelding machine, so will be easy to make. 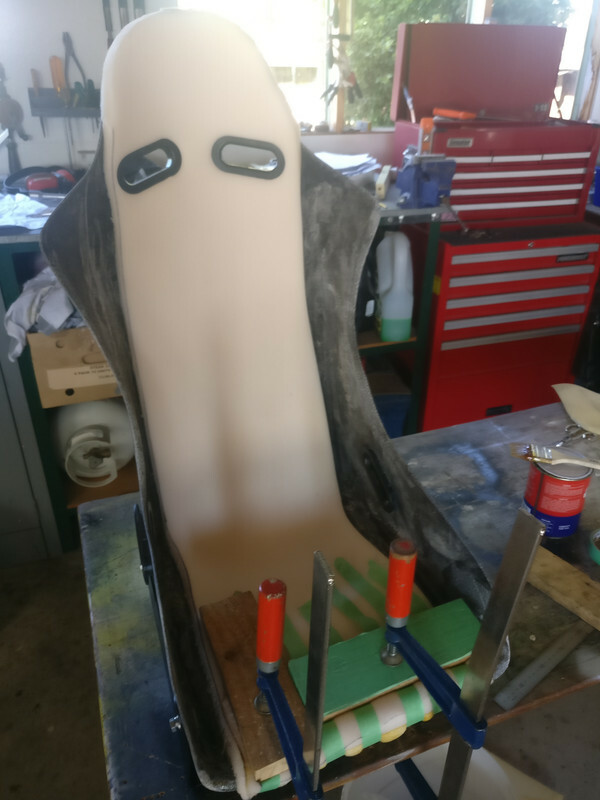 Spent some of today fitting extra foam padding to the bride seats I'll be using . Wife ordered they have to be comfortable for long trips. Then fitting some Jaz vynil covers which also have padding in them giving me 50 mm of comfort. Also fitted some foam sound/heat proofing to the passanger side . My old Sylva striker used to get uncomfortably hot for the passanger, so wanted to avoid cooking the wife this time. 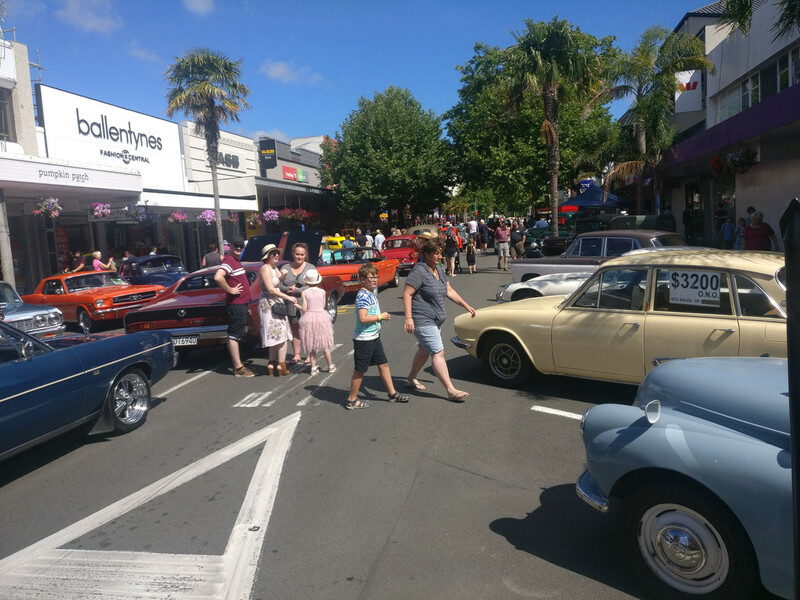 Had a bit of a break with it being Heritage weekend in Wanganui and hundreds of cars here on display. They had closed 3 blocks of the main avenue for the display. 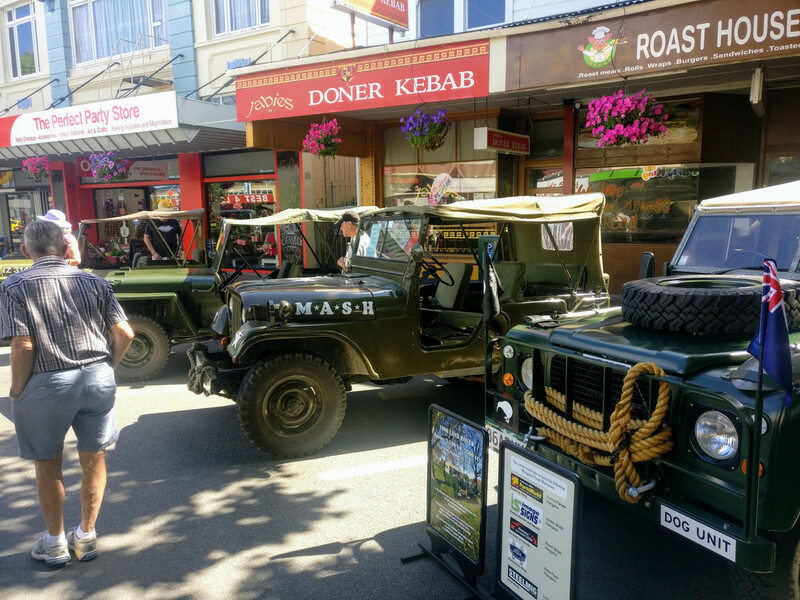 From army vehicles, hot rods, classic and race cars . But alas, only one scratchbuilt and no 7's.